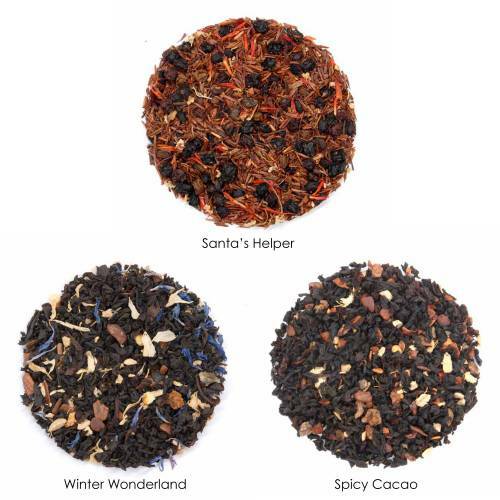 A Winter's Tale Collection - Our three favourite winter teas, perfect for all occasions. All three are great hot or cold, and make great additions to wintery cocktails. A winter favourite, black tea with spiced vanilla notes, some describe it as reminiscent of eggnog or Christmas in a cup! Black tea with smooth chocolate flavours and a hint of spicy from chili flakes. Ingredients: Organic black tea, organic cinnamon, organic chili flakes, organic cacao nibs, natural essences. These teas can all be prepared with boiling water. Spicy Cacao and Winter Wonderland should be infused for 2-3 minutes (up to 5 if using milk), Santa's Helper can be infused for 5-10 minutes. We recommend trying all three without any added milk or sweetener first, then adjusting to suit your personal preferences. These teas are naturally sweet without any sugars. Have you tried A Winter’s Tale Collection? Tell us what you think!